Like Stirling, a neighboring community, Magrath, Alberta, Canada, was settled as a result of a contract between the LDS Church and the Alberta Irrigation Company. In the deal, the Church sent settlers to build and maintain an irrigation canal in exchange for land and pay. 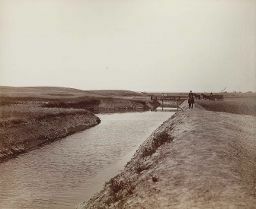 Because a water source was vital in order to settle that portion of arid Canadian land, the Galt Canal was conceived and the project’s directors recruited Mormon settlers for the task. Latter-day Saints were uniquely fitted for the job because of their experience settling Utah and Idaho—two other places where extensive irrigation projects were necessary for settlements to thrive. The Magrath town site was located by Charles Ora Card and Thomas Duce in the fall of 1898 and surveyed the next year, with blocks and lots divided according to Joseph Smith’s concept of the “Plat of the City of Zion.” Card soon traveled throughout Utah and encouraged members to move to Alberta, and the Church called families to relocate to Magrath and help settle the community. On April 20, 1899, Charles Heber Dudley arrived as Magrath’s first permanent settler. Levi Harker, a member of the Church who had moved to the first Mormon settlement in Canada—Cardston, Alberta—in 1892, was soon called to help colonize Magrath. Harker served as the local ward’s first bishop and was also the town’s first mayor, filling that position for two terms. Known today as “The Garden City,” Magrath is a town of just over 2,200 people and is still home to an LDS stake that includes seven wards and two branches. Magrath, Alberta, was settled as a result of a contract between the LDS Church and the Alberta Irrigation Company. As bishop for thirty-two years, mayor for two terms, and a long-time city council member, Levi Harker left his mark on the LDS settlement near Cardston. First colonized by Latter-day Saints in 1887, the southwestern corner of Alberta is home to several communities that began as early Mormon settlements. The town of Cardston—named for founder Charles O. Card—is notable for its temple, which was dedicated in 1923. “200 Men With Teams Wanted"
A brief video outlining the history of Magrath, beginning with the call to work on the Galt Canal.